Quilts can be very intricate, but there are also quilts that are simple enough for the beginner. The quilt top can be pieced from many different pieces of fabric or it can be a simple patchwork square. It can even be made with a solid piece of fabric for the quilt top, letting the hand or machine stitching form the quilt. The set size for a twin quilt is 39 by 75 inches. For the purposes of these instructions we will use these dimensions and make a patchwork top of 6-inch squares. Purchase your fabric. Unless you are using fabric scraps for the quilt top, you will need to purchase the following: ½ yard each of 5 different coordinating cotton prints; 2/3 yard solid color cotton fabric for the border; 2 ½ yards cotton fabric of any one of the 5 prints (for the backing and binding, which could also be a plain muslin if you prefer); batting for a twin bed (at least 39 by 75 inches); sewing thread; quilting thread; and poster board. Measure a 6½-by-6½ inch square onto the poster board and cut it out. This is your template for your patchwork squares. Cut a total of 432 squares out of the 5 print cotton fabrics you purchased. Cut 2 2-by-39½ inch strips from the solid border fabric. Cut 2 2-by-72½ inch strips, also from the solid border fabric. Cut the backing fabric to 42 by 78 inches. This is more than large enough for the backing and it will be trimmed to fit later. Cut strips for the binding out of the remaining backing fabric. You will need 2 strips of 2½-by-39½ inches and 2 strips of 2½-by-75 inches for the binding. The 2 side strips can be pieced with a diagonal seam. Choose 2 squares of print cotton fabric and sew them together with a ¼-inch seam allowance, right sides together. Pin when sewing wherever needed. Choose another square and sew it to the second square in the same manner. Continue until you have a 6-square strip. Set it aside and start again with 2 new squares and follow as before. Make 12 6-inch-square strips. Press the seams all to the right with your iron. Sew strip 1 and strip 2 together lengthwise with a ¼-inch seam allowance, right sides together. Keep adding strip after strip to your work. Clip all threads and press all seams downwards. Sew on the border. Pin and sew a strip of the 2-by-72½ inch solid color fabric to each side of the quilt top and then the top and bottom pieces, 2-by-39½ inch strips. Press all seams outwards. Press the entire quilt top to take out any wrinkles. Sandwich the quilt. Press the quilt back with your iron and then lay it on your floor, right side down. Next, place the unrolled quilt batting on top of it. Finally, place the quilt top, face up, on top of the batting. Pin or baste the 3 pieces together. Start in the center of the quilt and place a large safety pin or start your basting with long stitches. Work outwards from center to left and then center to right. Baste or pin center upwards and then center downwards. Do another basting across and one-fourth of the way down from the top and then another one across one-fourth of the way down from the bottom. The quilt sandwich should be secure. Quilt in the ditch. That means you will either hand quilt or machine quilt right on the seams. 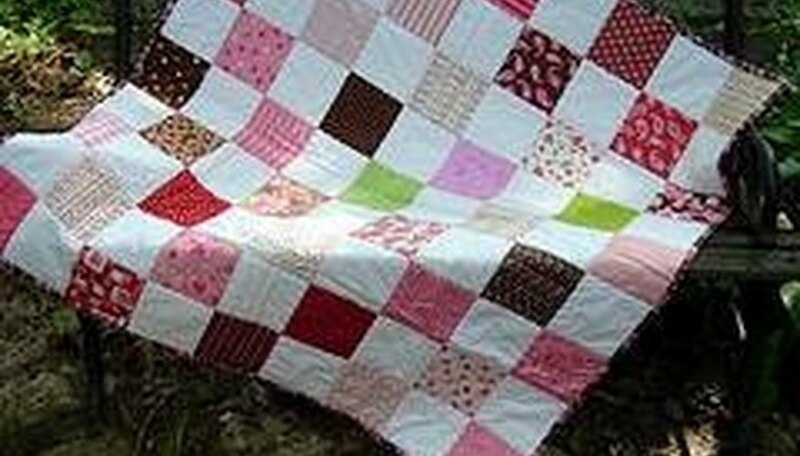 If you are machine quilting, use a longer stitch than for regular sewing. Start with the center seam and quilt with your quilting thread. Then complete the center seam from top to bottom. Continue going back and forth from one quilting line across and the next up and down until all the seams have been quilted. Trim the entire quilt so that all edges match the quilt top. Fold and press all 4 binding pieces in half lengthwise, wrong sides together. Then fold one raw edge, lengthwise inwards towards that center crease and press, on all 4 pieces. Pin and sew the 2 raw-edged side strips of printed fabric through the 3 sandwiched pieces, right sides together on the top of the quilt, 2½-by-75 inch pieces. Fold these strips around and hand sew the 2 sides with a hem stitch to the quilt back. Then pin and sew the top and bottom binding pieces, raw edges and right sides together. Make sure you fold under ¼ inch at each short edge so that the raw edges are tucked inwards. Flip the top and bottom binding over and hand sew to the quilt back. Wash and dry all fabric together before starting the quilt cutting. Different fabrics may shrink at a different rate. Garment sewing uses a 5/8-inch seam allowance, but quilting uses only a &#xBC;-inch seam allowance.